According to NIOSH (National Institute for Occupational Safety and Health), it has been found that 81% of construction worker fall injuries have had ladders involved. Besides choosing the proper ladder for the job, ladder inspection is probably the second most important step in ladder safety. Inspect all aspects shown above. Ask yourself are they damaged or functional? If damaged, immediately mark as damaged and take out of service. Never attempt to repair a ladder. Only the manufacturer or qualified people are allowed to make the repair. Inspect the locking braces/spreaders. A loose locking brace/spreader can cause a ladder to wobble and become unstable. 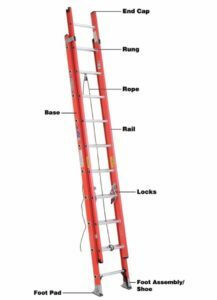 Is the ladder fairly clean, free of mud, grease and dirt? If the steps are not clean, a slip and fall may occur when ascending or descending the ladder. Ensure all feet are in place. One missing foot on a ladder can make it unstable. Are the manufacturer’s instruction, warning and safety labels visible and not covered over with paint or damaged? If so, do not use. Vital information about the proper use of that particular ladder are on those labels and placards. As opposed to locking braces/spreaders, the extension ladder has two C-shaped ladder locks (dawgs) that lock the ladder into position. Make sure they set and do not slip before climbing the ladder. This type of ladder is raised and lowered by a rope and pulley system. Ensure the rope is not frayed and that moves freely around the pulley, thus allowing the ladder to ascend and descend smoothly. These are just a few tips on a basic ladder inspection. Always refer to the manufacturer’s recommendations, safety and warning labels and placards for additional information. 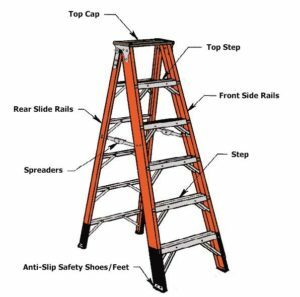 Only use the ladder if, after inspection, it is deemed safe to use and take any damaged ladder out of service immediately so it cannot be used by anyone else. Remember, you are the first line of defense when it comes to safety!